Placing your bed directly on the floor can often look like an accident or a mess—which is not ideal when you’re trying to design a thoughtfully decorated home that’s the best version of yourself, and doesn’t low-key resemble a frat house. 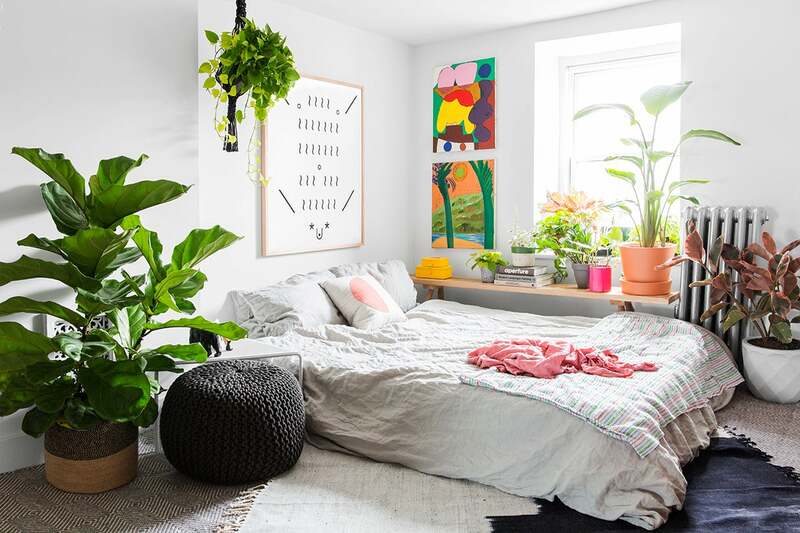 Whether you’re embracing the carefully undone bohemian aesthetic or opting for a simple, pared-back minimalist look, there are plenty of ways to style a floor bed that won’t feel like you’re still in college. Here are some of our favorites. Keep your space looking cohesive by opting for a neutral palette. This serene bedroom looks fresh and minimalist thanks to white-washed floorboards and simple bedding. If your space is feeling a little bare without a bulky bed frame to fill it up, dress up the room with a fun rug. Bonus points for layering textures, like jute and cowhide. Get creative with shelving, using it as an opportunity to add a layer of interest to the wall above the bed. A lower bed = more empty walls and ceiling space. Fill the void by playing with height; be it through a gallery wall of mismatched frames or different-sized pendant lights, like this arrangement of paper lanterns. The uneven effect only adds to the laid back vibe instigated by choosing to put your mattress on the floor. Follow the spirit of the frame-less bed, and eschew regular furniture and decor in favor of something more casual. Nightstand? Don’t need it; keep your favorite books stacked within reach for a makeshift side table instead. And rather than hanging all your artwork, do what blogger Erin Hiemstra did in her San Francisco home, and simply prop your pieces against the wall for a more relaxed style. Live in a tiny studio? There’s no rule that says you must take up space with a bulky queen mattress. A twin sized option that can double as a sofa during the day and easily convert into a comfy bed at night is perfect for both small-space dwellers and people sharing a bedroom. Your bed is floor level, so it only makes sense that everything else should be within reach, too. Move your headboard down to prop it against the wall like in this room, and eschew a standard bedside table for a chic tray instead. There’s something zen and minimalist about having your bed on the floor instead of a more formal sleeping arrangement, so transform your space into the ultimate haven with muted colors and textured bedding. Candles and chic vases further add to the relaxed vibe of this particular room. With a window like this it would be a shame to cover it up, so a bed-on-floor situation is the only way to go. Let the light shine through by providing completely unobstructed access to the window. Plus, having your bed directly under the window may help you naturally wake up earlier thanks to the early-morning light. A whitewashed aesthetic not only imparts a space with a uniform feel but also manages to camouflage the fact that the bed sits directly on the floor. One of the potential downsides of having your bed on the floor is that you may not be in easy reach of a light switch. Sidestep this problem by attaching the light to the wall just above your mattress (with an easily-accessible switch, of course!). If you’re lucky enough to have a lofted area in your apartment, place the bed on top for an instantly intentional look. Similarly, a tapestry can work as a headboard, adding a bohemian vibe to any floor bed. Go colorful or try a neutral option with lots of texture. Keep the bed from looking sloppy by choosing basic bed linens and sparse decor. If your bed is always tidy, it will look ultra-modern, not messy. You make the rules, so you decide if your bed needs to connect with the wall, and how. Experiment with the angle at which you place your bed and even layering rugs underneath. This story was originally published July 31, 2015. It has been updated with new information.